7 months 6 days ago. Congratulations to long time members Darwin McMurray (University of Texas at Austin), Amy Zuidema (Ithaca College), and Ryan Allen Schmidt (University of North Carolina at Greensboro) who are finishing up at GVSU and then off to graduate school. These three WILL be forces in the music field, and we look forward to following their adventures! 4 days 21 hours ago. Decompress. Repeat. 3 weeks 3 days ago. From the vaults: a stunning performance featuring guest artist extraordinaire Todd Reynolds. 1 month 2 days ago. Just out today, a terrific new collection of Michael Lowenstern hits never before available on Spotify! 1 month 2 weeks ago. Check this out...released today, a new album from our pal Ginger Runner. We performed a few of his works on our 2018 summer National Parks tour, where they were always the crowd favorites. 1 month 3 weeks ago. 1970s downtown New York City and Steve Reich’s brand of Minimalism are inextricably linked. That is all about to change. His era-defining opus, Music for 18 Musicians, one of his most enduringly popular works with its creamy orchestra- tion and trippy patterns, has found new roots in the heartland. A band of regular Michigan students and volunteers led by Bill Ryan has devoted the last year to perfecting it; in the process, turning it into something of a lifestyle. Originally released as a hybrid SACD/CD audiophile, surround recording (innova 678, out of print), and now as a regular stereo CD, it captures every phrase of the work, as though you were hearing it for the first time in your life, farm-fresh. Engineered by Silas Brown on location at Grand Rapids’ Victorian temple to great music, the St. Cecilia’s Music Center, the work seems newly-minted for the 21st century. Walking around Allendale, Michigan, home of the ensemble, where the land is flat, where one can see for miles and miles and miles, and where this view sometimes seems infinite, the music seems written for the location. The piece is huge, monolithic, yet unencumbered by its hour-long frame, by its huge staff of players and interlocking rhythms and melodies. It stretches long and far and encourages deep breathing and space, as does the home of this recording: The Grand Valley State University New Music Ensemble performs “Music for 18 Musicians” with a spirit and abandon befitting the passion of its composer, inspired by the commitment and experience of its leader, and with the exuberance and vision of its youth. With performances lauded by the New York Times and Bang On a Can Marathoners, we now invite you to discover this ensemble, and to rediscover this extraordinary work in its 100% organic glory. The Grand Valley State University New Music Ensemble, from the farmlands of Allendale, Michigan, provides a case study in how new technology is playing to classical music's benefit. Last year, part of the group traveled to New York to attend Steve Reich's seventieth-birthday festival at Carnegie Hall and participate in a workshop. The Grand Valley's director, Bill Ryan, wrote a firsthand account of the visit for the Web site NewMusicBox, introducing his ensemble to a wider audience. In June, they performed Reich’s "Music for 18 Musicians" at Bang on a Can’s annual marathon concert in downtown New York; their time slot was five in the morning, but, for reasons that no one could quite understand, some four hundred listeners showed up to hear them play. The ensemble's recording of "Music for 18" is being released this week on the Innova label, its arrival heralded by a striking video "trailer" on YouTube, which ingeniously contrasts Reich’s hyper-urban music with shots of rolling cornfields. The Michigan musicians play with glistening precision, yet they also bring out the variously jubilant and wistful emotions beneath the surface of Reich’s score. The result is a vibrant recording that deserves to leap from the new-music ghetto onto the mainstream charts. In these unsettled times, it might have an outside chance of doing so. After all, for a little while the other day,a surprising name appeared at the top of Amazon.com’s Top MP3 Artists, outperforming even Kanye West: Richard Wagner. Justifiably proud of the performance the group presented on campus in November, Mr. Ryan sent recorded excerpts to friends. The effort paid dividends: Through the violinist Todd Reynolds, the ensemble was invited to play “Music for 18 Musicians” at the break of dawn during this year’s Bang on a Can Marathon in New York. The excerpts also helped secure a deal with the Innova label to issue a studio recording of the piece. Mr. Ryan has posted a slick promotional trailer for the disc on YouTube. "They worked for a year on this thing, but what you feel as a result is a kind of ease," Mr. Reich said. "You know that these people are enjoying themselves; when you watch the video, you really see it. And it's great to see, because these are young people, and they're the future." The story of the year in new music circles. Out in the farmlands of Allendale, Mich., Bill Ryan, the director of GVSU's new music group, decided to have his all-student, all-volunteer band learn to play Reich's 1976 masterwork—long considered one of the most challenging pieces in new music. It was a labor of love—intense, obsessive love—and they not only learned to play the piece, they learned to play it well. This new disc (a hybrid Super Audio CD, so it will play on usual CD players) comes with a rave by the composer himself, and it's easy to hear why. The Grand Valley State University's New Music Ensemble plays the heck out of this work. Rock-solid ensemble and vibrant phrasing...A must-hear, from beginning to end. The results are clearly audible in the sharp-edged, hugely energized playing on the Grand Valley State Music Ensemble's new disc, on Innova, of Music for 18. Yes, they actually use 20, and somebody in the Reich band told them that that was okay. REICH AND ROLL: Everybody loves an underdog. That fact, plus a deep and abiding passion for Steve Reich's Music for 18 Musicians, is what might have originally driven hundreds of listeners to check out a 5 a.m. performance of the piece by a group that almost no one had ever heard of. The setting: the annual Bang on a Can marathon, held at the World Financial Center's Winter Garden in lower Manhattan last June. The players: the Grand Valley State University New Music Ensemble from Allendale, Mich. The music: one of Reich's most popular and influential works. If that was too early for you, the GVSU players recently released their recording of Music for 18 Musicians on the independent label Innova. The result is a hyper-propulsive and yet silkily beautiful, entrancing and utterly alive interpretation that more than holds its own. The group mostly comprising students and entirely of volunteers, led by composer/conductor Bill Ryan spent nothing short of a year painstakingly working on this one mammoth piece. The results were, by all accounts of those who greeted dawn with these young musicians, simply exhilarating. It wasn't that they were simply able to negotiate a work that is famously excruciatingly difficult to play; instead, they fully and confidently claimed it as their own. And Reich's writing, by turns ebullient and meditative, proved the perfect match to greet the light of a new day. When Steve Reich released Music for 18 Musicians (ECM, 1978), it was a consolidation and major leap forward in the pulse-based music that the minimalist progenitor had been exploring on earlier compositions including “Four Organs” (1969), a piece that relied on nothing more than a six-note chord, yet was a near flat-out sonic assault. 18 Musicians was an altogether more complex and sophisticated work, with a broader textural palette based largely on tuned percussion—piano, vibraphone, marimba and xylophone—but also working with maracas, voice, strings, and clarinets to create a sweeping, hour-plus long suite that was hypnotic, melodic, and eminently accessible. With the mathematical precision by which its eleven sections and wrapping “Pulses” develop, it's a demanding suite to play. It's also a challenge to create differentiation from previous versions, especially when Reich himself has released two versions—the original 1978 ECM recording and a later, slightly longer 1996 Nonesuch Records edition. For a University Ensemble to take on this challenging music is impressive, and Grand Valley State University's New Music Ensemble has done a remarkable job with its own take on Music for 18 Musicians, under the guidance of director Bill Ryan. Length-wise at 61 minutes somewhere between Reich's two versions, what helps define this version is that, while there are, indeed, 18 musicians, and the basic instrumentation is the same, the apportioning of that instrumentation is different. Reich's 1996 version featured seven pianos to the NME's six; two maracas to NME's three; four xylophones to NME's two. It's a subtle difference but, when assessing NME's reading, one that changes the complexion of the piece ever so slightly. While both versions traverse sonic territory from airy atmospherics (despite the ever-present pulse that drives the entire piece) to denser counterpoint, NME's version feels ever so slightly lighter. Reich has always managed to possess a certain levity when compared to minimalist cohort Philip Glass' greater gravitas, leaning more to the ethereal, even during the more active “Section XI.” With a composition like this, the mix also becomes an equal part of defining the overall soundscape, and Ryan and co-editor/producer Silas Brown do a marvelous job in spreading the sound across a three-dimensional aural landscape, making it an even greater trance-inducing experience than Reich's 1978 original. Reich, like his minimalist co-founders, has evolved beyond the stricter regimen of his earlier work, yet Music for 18 Musicians remains a classic, and the perfect entry point for those who've yet to take the dive into a style of music that is often criticized for being too strongly based on mathematics and logic. 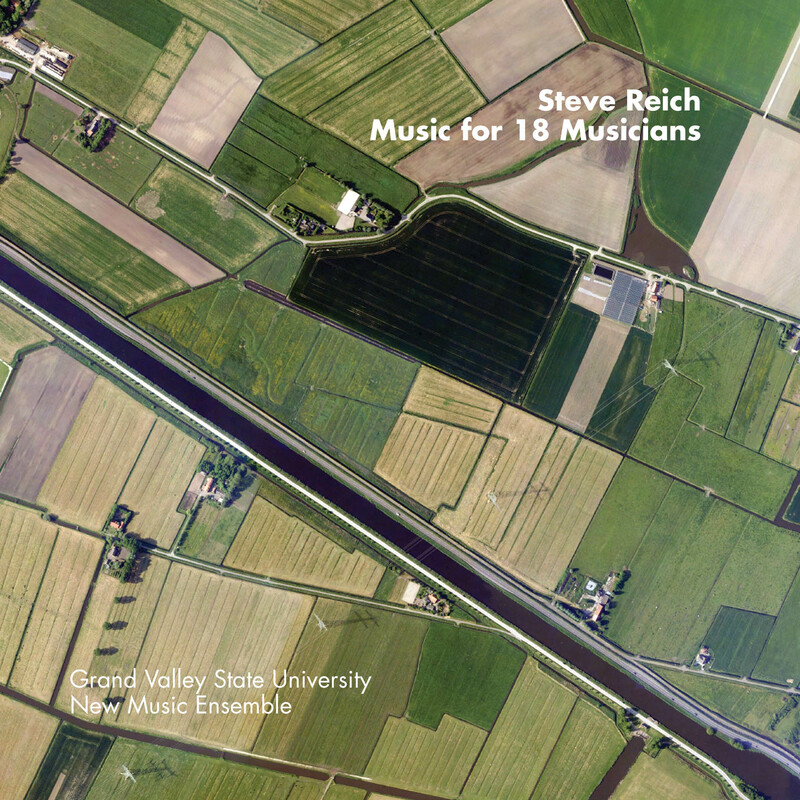 Ryan's New Music Ensemble proves, with its version of Music for 18 Musicians, that the beauty of Reich is just that: beauty—and a remarkable ability to create resonant, evocative music from a highly considered standpoint.